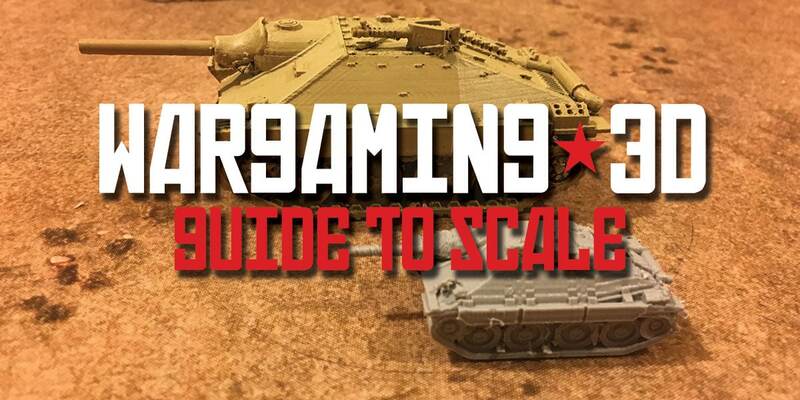 When I first started getting into 3D printing for wargaming, I ran into an issue that every single gamer with a 3D printer has experienced at least once. I found a great file for an object I wanted to print, but it was in the wrong scale. Usually if you are printing for a game like Bolt Action, it starts like this: You stumble on the massive cache of tanks contained within m_bergmans files, and realise that they are all 1:100, or 1:200, the only problem is, the game you are playing is in 28mm scale, which is played with either 1:56 or 1:48 scale vehicles (long story, officially 1:56 is the scale for Bolt Action, but due to the heroic scaling, and availability of 1:48 off the shelf models, some people prefer to go slightly bigger). What all of this means is that you’ll need to rescale your models so they print the correct size. A Stuart Tank from the m_bergman files printed in 1:100 (front) for Flames of War and 1:56 (rear) for Bolt Action. This is exactly the same .stl file used for two different scales, showing the versatility of 3D printing. 100/56*100 = 178.571429, or to two decimal places, 178.57%. Or click here to view it in Google Docs. Most people start off creating GCodes in a slicer like Cura, so if its your first time, heres how you rescale a file. B) Drag files onto Cura and arrange them in the orientation you prefer, for me, I prefer to print with the tracks flat on the print surface, and the barrel horizontal (I find that vertical barrels are less strong and tend to snap easily). C) Click on scale and enter the percentage you wish to scale X, Cura should automatically change Y and Z scales as well.